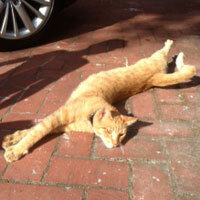 My family adopted a sweet Orange Tabby from Palo Alto Animal Services in 2010. The day we were able to bring our cat home the Giants were in the World Series, so we decided his name had to be Buster Posey. Buster is a very loyal, loving cat with lots of character. 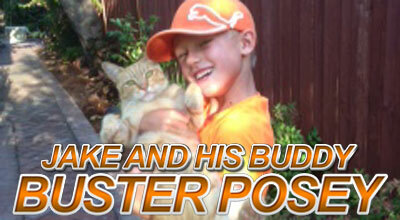 Buster loves his family and especially my son, Jake. When Jake is outside playing, Buster Posey follows him where ever he goes, participating in the two square or basketball game, which essentially means lying right in the middle of the court. He has very little fear of being trampled by feet or hit with the ball, which happens from time to time. He will chase a stray ball down the street as if to make sure it doesn’t get too far away from my son and his friends. He loves children and loves to be petted by any child who walks by the house. When things are calming down at night and my son is ready for his nightly bath, Buster begins his next favorite activity, which is teasing the neighborhood beagles. He climbs on our neighbor’s rooftop to wait for the beagles to notice his presence. Once they do, Buster’s fun begins. As the poor beagles go crazy running back and forth barking, Buster very condescendingly stares down at the beagles as if to say, “You can’t touch this”! If he could stick out his tongue and say “nanny nanny” he sure would. 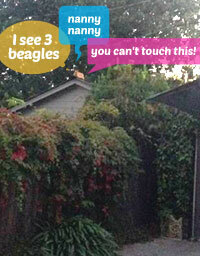 It’s not only beagles he teases, it’s any dog that he feels deserves a little torment. He will sit on fences or in front of windows in our neighborhood and watch these poor little dogs go crazy barking in an attempt to get a piece of Buster, which will never happen. I can almost see a smug grin on his face when he is home for the evening after a successful night of canine teasing. He is a great cat and a great companion for my family. We are lucky to have such a wonderful kitty!